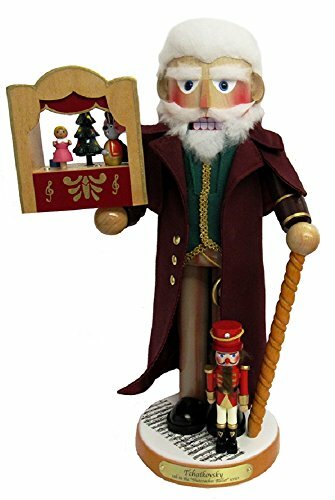 This17.5-Inch Steinbach Musical Tchaikovsky Nutcracker from Kurt Adler pays homage to the man behind the beloved Christmas tale, The Nutcracker Ballet! The 5th piece in Steinbach's Nutcracker Ballet Series Tchaikovsky is wearing a dark green vest and a long maroon coat each with gold embellishments. In his one hand is a wooden cane and in the other is a miniature stage with the Clara and the Mouse King. At his feet stands the proud Nutcracker Prince. When wound, this musical piece plays the tune "Nutcracker Ballet". Like all Steinbach creations, this piece is hand crafted in Germany with the finest care and attention to detail.